Following the release of The Frighteners on DVD in May 2017 there have been four more releases this year in the Forgotten TV Drama DVD range (in association with Network). The second release comprised three Nigel Kneale plays. 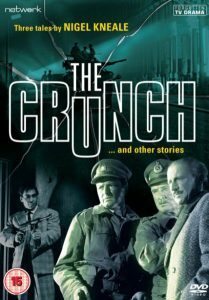 The Crunch (ATV 1964) is about an attempt to avert a nuclear catastrophe in London, written for ITV’s Studio ’64 series; Ladies’ Night (Central 1986), part of ITV’s Unnatural Causes anthology series, is a chilling story of misogyny involving members of a gentlemen’s club who turn on a woman after she ridicules them; and Gentry (Central 1988) is a suspense drama featuring Roger Daltrey as an East End villain. Billy Smart has written viewing notes for the three plays and director Roy Battersby – who was involved in our screenings at Manchester earlier in 2017 – has written an introduction to Gentry. 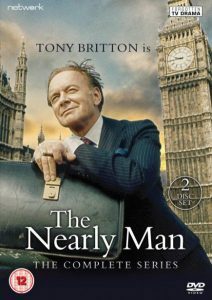 The third release in the series is Arthur Hopcraft’s The Nearly Man, a Granada drama about a Labour MP (Tony Britton) who has an uneasy relationship with his northern working-class constituency. The DVD release includes the 1974 single play (voted Best Single Play in 1975 by the Broadcasting Press Guild) and the seven-part series which followed in 1975. John Hill has written viewing notes, which include an extract from an interview with John Irvin, who directed the original play and four episodes of the series. The interview took place at our 2015 conference on ‘The Forgotten, The Lost and the Neglected’ and John Irvin, along with producer Jonathan Powell, also introduced the screening of the pilot as part of our Forgotten TV Dramas season at BFI Southbank in February 2017. The two most recent Forgotten TV Drama releases see the launch of a new series in association with Network: Armchair Theatre Archive. 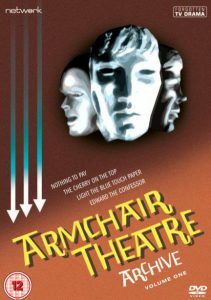 Armchair Theatre was launched on ITV in July 1956 and is generally credited with changing the look and style of television drama in terms of both writing and methods of production. It is also celebrated for its encouragement of new forms of contemporary socially-conscious drama at the end of the 1950s and beginnings of the 1960s. 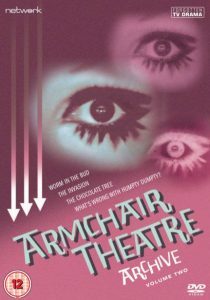 Armchair Theatre was, however, not only a very long-running series, continuing throughout the 1960s and into the 1970s, but was also responsible for a broad mix of plays that included comedies, thrillers, romance, fantasy and science-fiction as well as works of social realism. Although Network has already released some of the most famous examples of Armchair Theatre – such as Alun Owen’s Lena, O My Lena (1960) and Harold Pinter’s A Night Out (1960) – Armchair Theatre Archive, as part of the Forgotten Television Drama series, sets out to introduce some of the less well-known plays that made up the weekly diet of Armchair Theatre and which demonstrate the range, quality and interest of the dramas that were produced. Volume One contains the Welsh writer Alun Richards’ Nothing to Pay (1962), featuring Clifford Evans, Kenneth Griffith and Philip Madoc; Donald Churchill’s comedy of the sexes The Cherry on the Top (1964), featuring Robert Lang and Pauline Yates; John Hale’s anti-war drama Light the Blue Touch Paper (1966), featuring Ronald Hines and Anna Massey; and Leigh Vance’s black comedy Edward the Confessor (1969), featuring Beryl Reid, Ian Holm and Alfred Burke. Volume Two contains John D. Stewart’s Worm in the Bud (1959), featuring Barry Foster, Joseph Tomelty and Elizabeth Begley; Angus Wilson’s sci-fi oddity The Invasion (1963), featuring Patrick Wymark, Frances Rowe, Athene Seyler and Eleanor Summerfield; Andrew Sinclair’s satire on racial politics The Chocolate Tree (1963), featuring Paul Rogers, Zena Walker, Peter McEnery and Earl Cameron; and Hugh Whitemore’s ‘swinging sixties’ satire What’s Wrong with Humpty Dumpty? (1967), featuring Donald Houston, Katherine Blake and Lynn Redgrave. Viewing notes for both volumes have been written by Lez Cooke, John Hill and Billy Smart. Stephen Bourne has contributed notes on The Chocolate Tree. The release of Worm in the Bud by the Northern Irish writer John D. Stewart is particularly notable. This is the oldest surviving play by a Northern Ireland writer and was restored as part of the Forgotten TV Drama project. John Hill also curated a John D. Stewart event for the Belfast Film Festival and was responsible for screening Worm in the Bud for the first time ever in Northern Ireland given that the programme was broadcast before local television station UTV had launched. Further releases in the Armchair Theatre Archive series as well as other forgotten television dramas are set to follow in 2018.